In the case of multiple decks, you would divide (or estimate) the “true count” by dividing your number with the number of decks of cards left to play in the shoe. ie – if your count is +6 early on in a 6-deck shoe, then you would divide the +6 by the number of decks left in the shoe (6) and end up with the true count of +1 – so here you would add 1 bet to your standard bet. Your Count Determines Your Bet Amount! This introduction is very basic, but we will add more strategy articles on blackjack card counting in the future. 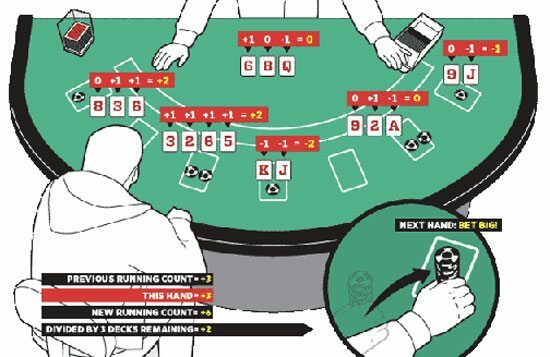 In the meantime, we recommend you practice blackjack basic strategy. You can learn and practice blackjack strategy at Blackjack-Trainer.net. Counting cards won’t help you if you cannot play perfect blackjack strategy. You can also practice your blackjack card counting when playing live dealer blackjack. As you gain experience counting cards playing online, that practice will translate to when you physically go to a brick and mortar casino. We recommend trying the live blackjack at the BetOnline Live Casino! Read our review of the BetOnline Live Casino here. Visit Casino Sites USA for more reviews of US-friendly casinos.